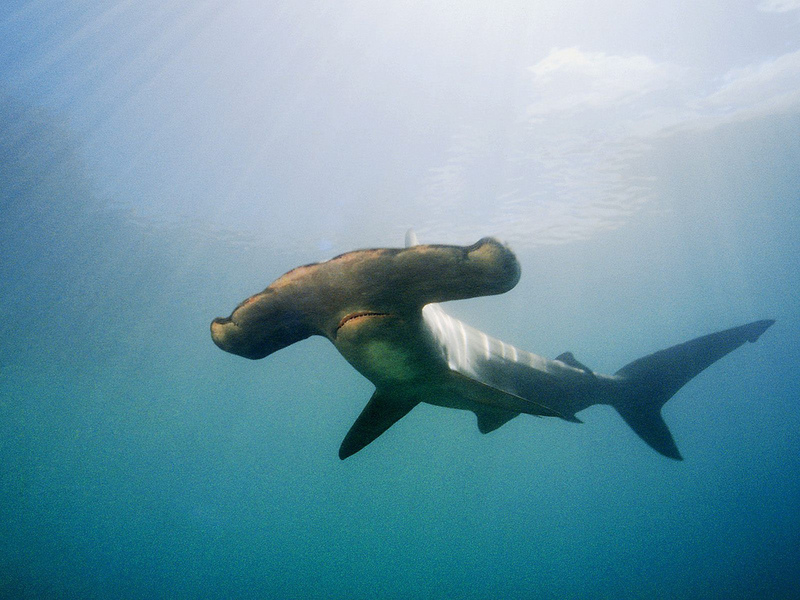 Marine organisms generate an electric field around their body; some believe the shape of the hammerhead’s head allows electro-receptive organs in the animal to have increased sensory abilities – a beneficial quality when searching for prey. In addition, the head shape may aid in their movements, providing lift or possibly a smaller turning radius. Since sharks are ‘apex predators’ at the top of their food chain, they may influence the population structure of species lower in that food chain. The sharks are found in warm and tropical waters, worldwide from 46° north to 36° south. They can be found down to depths of over 1,600 feet, but is most often found above 80-feet. During the day they are more often found close to shore and at night they hunt further offshore. The scalloped hammerhead, one of the most commonly seen hammerhead sharks in Hawaiʻi, generally reaches between 5 to 10-feet in length – adults are usually found in the open ocean, often around seamounts or outer reef slopes. Females travel to shallow, protected waters in the spring and summer months to give birth. It is estimated that as many as 5,000-10,000-shark pups are born in Kāneʻohe Bay each year and that the pups remain in the bay only 3-4 months after being born. They eat small fish and crustaceans. Though hammerheads are not usually aggressive, they should be considered potentially dangerous. The image shows a hammerhead shark. In addition, I have added other images in a folder of like name in the Photos section on my Facebook and Google+ pages.